Soulight is your mobile well-being companion. Learn more about the Soulight app or sign up. 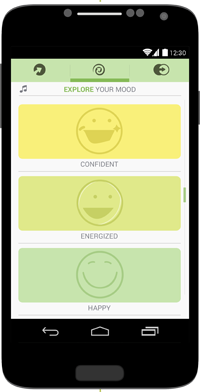 The first page in Soulight helps you to quickly find out how you feel. 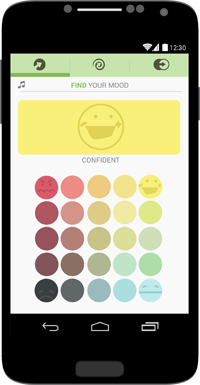 Using a combination of colors, music and descriptive words it allows you to find your mood in seconds. It helps you to find out where you are and connect with yourself to keep you well. 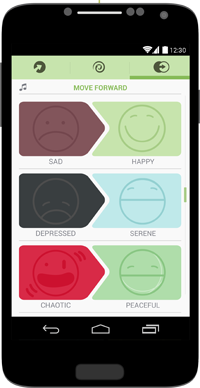 The second page in Soulight allows you to explore your mood territory in depth, while accepting, reflecting and connecting with yourself. Soulight allows you to explore these emotional states by expressing them through music. The music is personalized to fit your needs at that moment. By now you will have found your mood and explored it, reflecting if that is where you want to be. The third page in Soulight allows you to move to a different emotional state. You select one of the musical journeys and it uses personalized music and corresponding colors to gradually move you to your desired mood. Supported by Nominet Trust and New Media Scotland’s Alt-w Fund with investment from the Scottish Government. Part of the Ginsberg ecosystem.